I’m expecting my first child in June (a boy!) and I’d love for him to look at this kit some day and ignite a passion for ships and modeling that we all have. 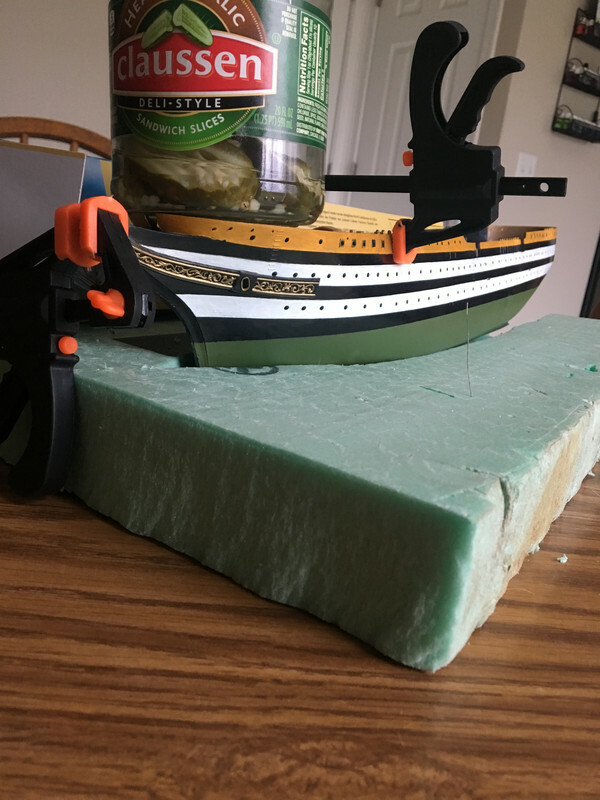 As of right now, I’m in the process of re-gluing the bow. The kit has warped so bad (probably from my horrible brake fluid bath a few years ago, lovely story there.) that she split with just one deck dry-fitting. 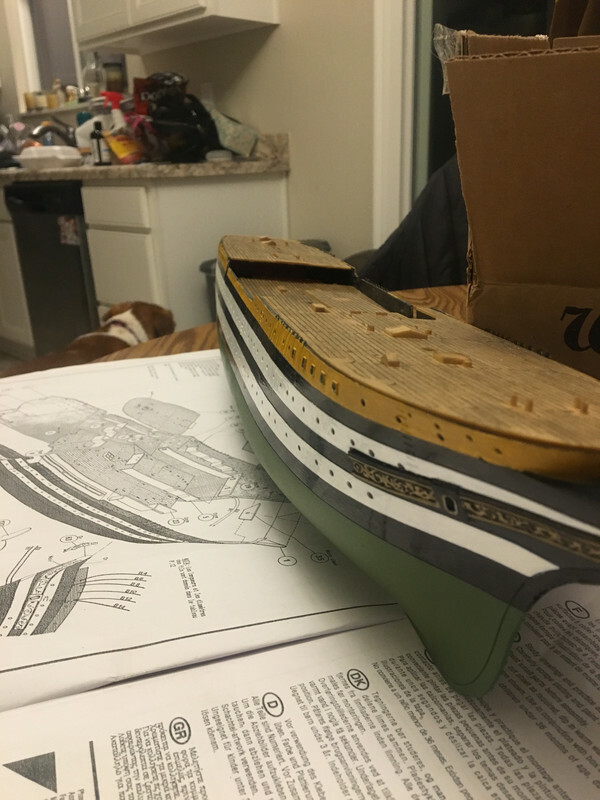 I still have to touch up the hull quite a bit, but then the true challenge of deck fitting begins. I‘d love to hear feedback and tips/tricks from everyone here.. Like I said before, I want my son to be amazed someday! Thanks in advance, appreciate any feedback or advice! Looks like you're doing OK. She's shaping up well. Keep the photos coming so we can see how you make out with the build. Like your use of the organic weight. After using it you just eat it. Just remember that it gets lighter after each use(unless you don't like pickles). I'll be watching as well. I have this kit, and have been wanting to start it, but had lost the instruction book in a move. Your painting is fantastic. This kit has very little raised detail so its hard to make everthing line up and look good. Thanks guys! I purchased this kit in 2014, completely destroyed the paint job with terrible masking and impatience.. 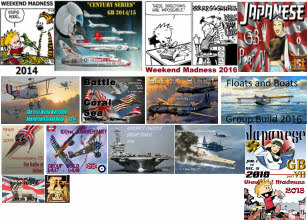 I ended up nuking the entire hull in a brake fluid bath.. TWICE! And didn’t touch her until recently. The waterline was ‘airbrushed,’ as in my first ever attempt to airbrush with a cheap starter kit. It was a fight to say the least.. I’ll never be able to duplicate that color because it’s so many random shades of unintentional green! 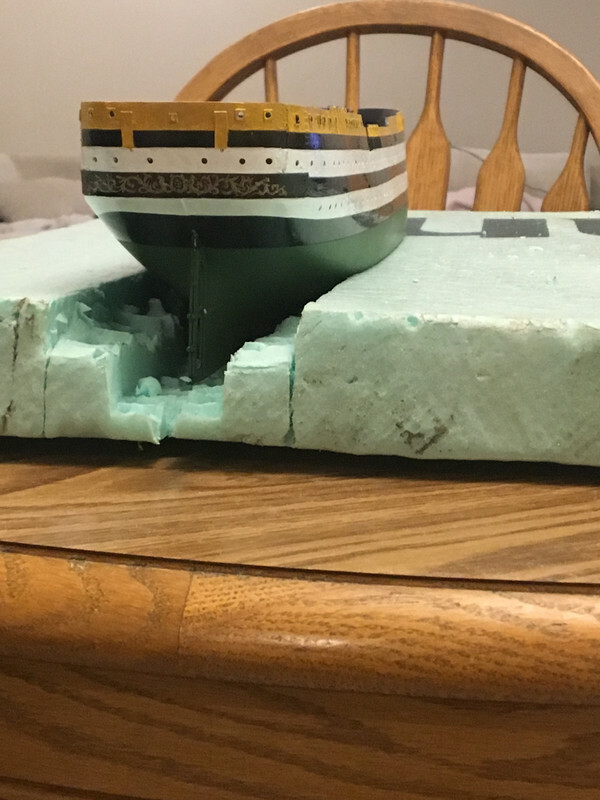 The pressure ran out just when I finished, so my confidence to finish the hull with an airbrush was gone. So the white / black stripes and gold detail? All paint pens!!!!!! Just coat after coat. I’m hoping to work on her this week, will hopefully have progress pics with plenty of questions. I’ll send you scans of the instructions! They’re in French unfortunately (lovely Heller problem I suppose), I can have them to you by Wednesday. I sent you two PMs. There's an unconventional story behind the decks as well.. 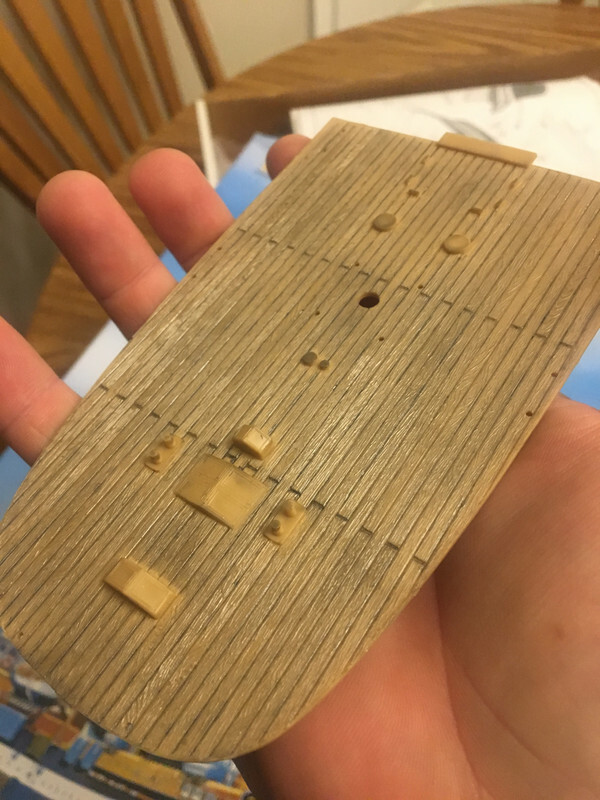 I really wanted to make these decks something special, so at first I looked into buying a sheet of 1:150 scale wood decks with no luck. I then thought, 'I'll take the time to cut individul planks out of balsa wood! It will be worth the effort!' 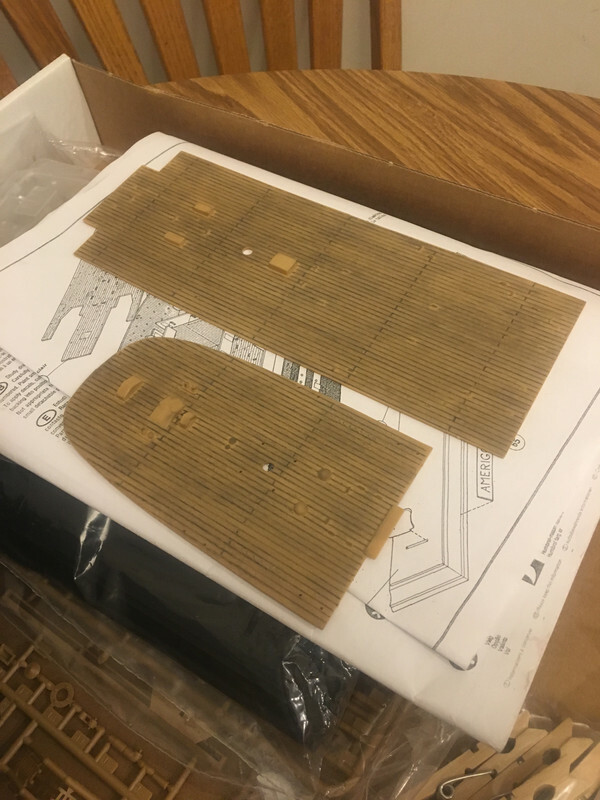 Went to Michael's, got the thinnest piece of balsa wood I could find, was so excited experiment with it... And in 5 seconds realized it was a bust..I have zero experience with wood cutting tools, thought I could use an exacto, instantly said 'NOPE!' So out of sheer frustration I started painting the decks in different shades of brown, and realized it would just look like every other 'meh' deck I've ever made. So after even WORSE frustration while getting the paint off, I just picked up a mechanical pencil and started filling in the seams. There was ZERO method to the madness, just started randomly while cursing perfusely. I got up from my chair, and my thumb smudged across the pencil lines.. 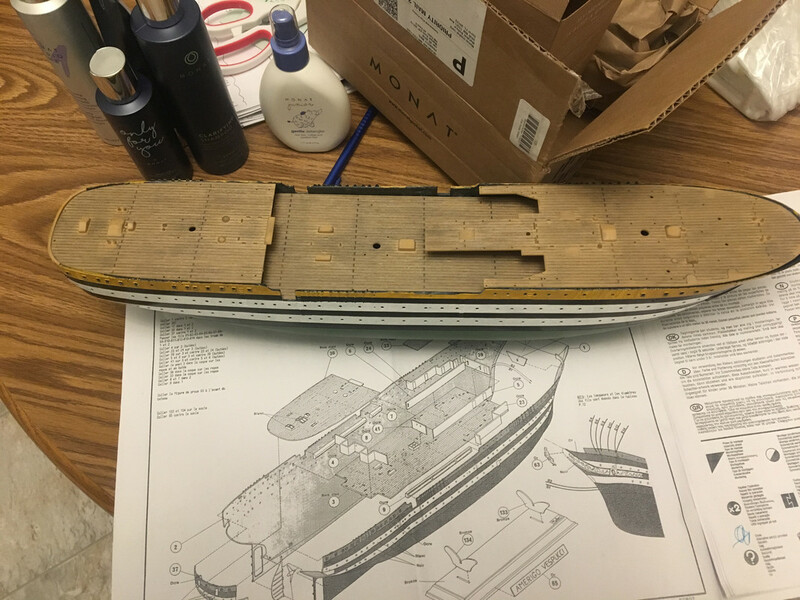 I've never done anything with so much excitement in my modeling life.. After filling in every seam with a plain ol' mechanical pencil from the dollar store, I took a deep breath, and just started smudging horizontally with the planks to pull the graphite out of the seams and across the grain molding with my thumb and palm. After 5 minutes with my hand pretty much black, my jaw was dropped.. It turned out to be the best deck I've ever made! 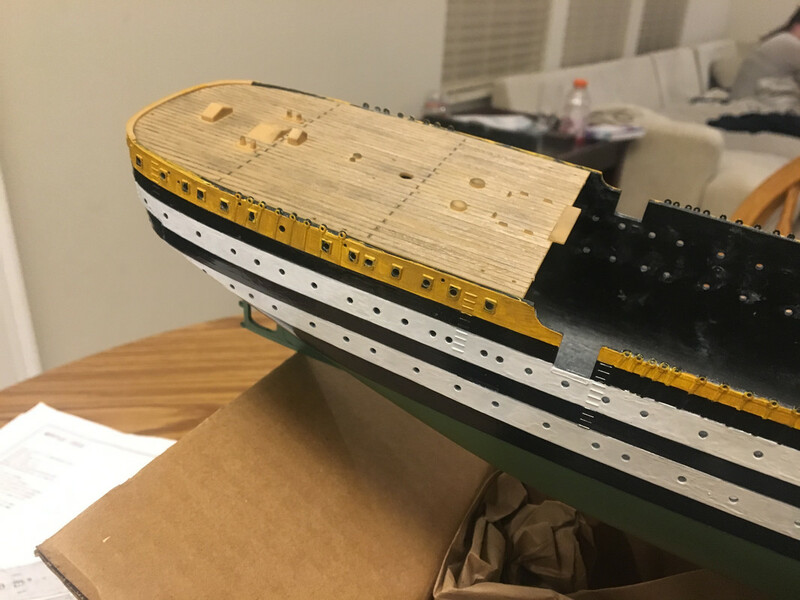 It's so easy to 'even out' the appearance of weathering, just need to fill the seams a little more, or just use the eraser (I'll probably touch them up before I install them into the hull). Apologies for the long reply, but I just couldn't believe how lucky I got out of pure frustration! Thanks again, definitely reccomendy trying it on plastic kits. Big thanks for the hints! Can you do me one more favor, and make some close-up photos of the deck? I will do it the same way on my ship! I too want to thank you for sharing your technique on the wood decks. It sounds like it is a very forgiving way to add the depth and detail. And if you want more simply add more in the recesses; for less effect use an eraser on the high spots. When you get it how you want it, do not forget to seal it. Nice job with the paint pens too. Looking gret so far, keep it up. Here’s some more pictures! Glad I took them, it’s a nice way to see where some touch ups are needed. Let me know if thep pencil technique works for you.. I’m curious to see if I just happened to get lucky with this kit (just happened to be the right plastic tan?). I’ve never sealed a deck before, any suggestions? I reckon it will fade over time like all of my old letters written in pencil! Very nice work on the deck painting. You have a choice between beauty and authenticity. Most wooden ship decks were not varnished or anything- just plain wood. I coat wood decks with Testors dullcoat when done painting. Thanks Don, I'll have to test it.. The deck was all done with graphite (mechanical pencil / rubbing w/ my hand), curious to see what a gloss coat will do to it! 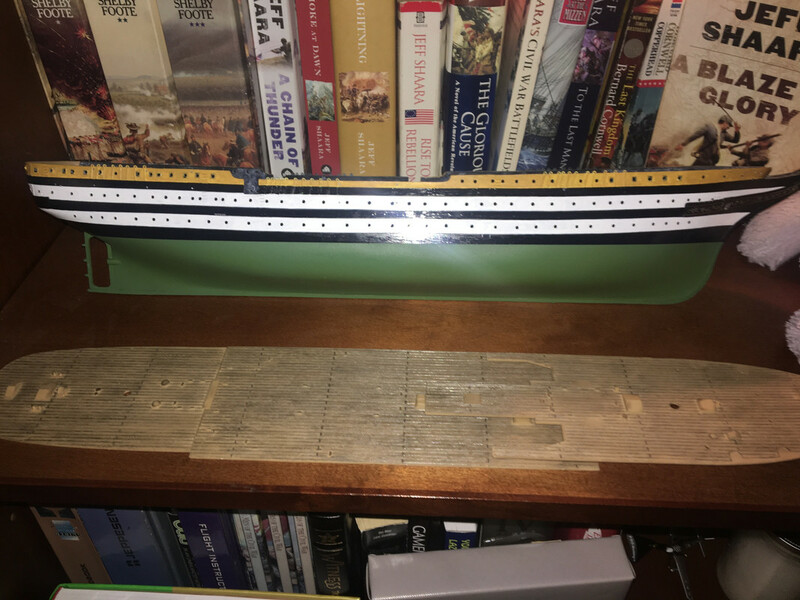 The Amerigo Vespucci is still sailing and in amazing shape, so maybe a nice varnish will really help it stand out! If it comes to aging and wood, I will use a matt (flat) vanish, transparent. In my earlier days, I used a mix of mostly transparent matt vanish with a small amount of matt (flat) black in it. What this would do is, to settle in bigger amounts inside niches (lowered areas) and this way also give a darkened, aged effect to the deck or other surfaces, while higher areas stayed almost unchanged clear (transparent). Sometimes, to make this vanish even more flowable, I added also some thinner into this mix. But this mix can be used only on painted surfaces where the paint has been fully dried since weeks or even months, to avoid a cracking effect on the paint layer below (the thinner would cause this). I used a brush for that technique. The deck is looking real good. A lot of work paid off. It looks dirty, but I suppose that's the point. Since she's a training ship, she's kept up well. The decks are teak and get replaced a lot. They have the characteristic color after a year of aged teak- gray. Don't give up on wood. Balsa has no place in modeling unless it has to fly. Basswood is a readily available hardwood that is sold in thin strips and is easy to work with. Don't see this kit built too often, it's looking good. The decks look great! Thanks for sharing and for the tip. I have that model in my stash, might have to use a similar technique.